Just when The Donald was on a streak of being fairly well-behaved, he reverts to form and steps, nay, cannonballs into a big pile of manure. Later at a campaign rally in Fort Myers, Florida, Mr Trump decried Mr Rahami's treatment for gunshot wounds and his legal representation, which is his constitutional right under the Fifth Amendment. "But the bad part, now we will give him amazing hospitalization. He will be taken care of by some of the best doctors in the world," Mr Trump said. "He will be given a fully modern and updated hospital room. And he'll probably even have room service knowing the way our country is." He suggested that any punishment would be too lenient on Mr Rahami. "What a sad situation," he added. 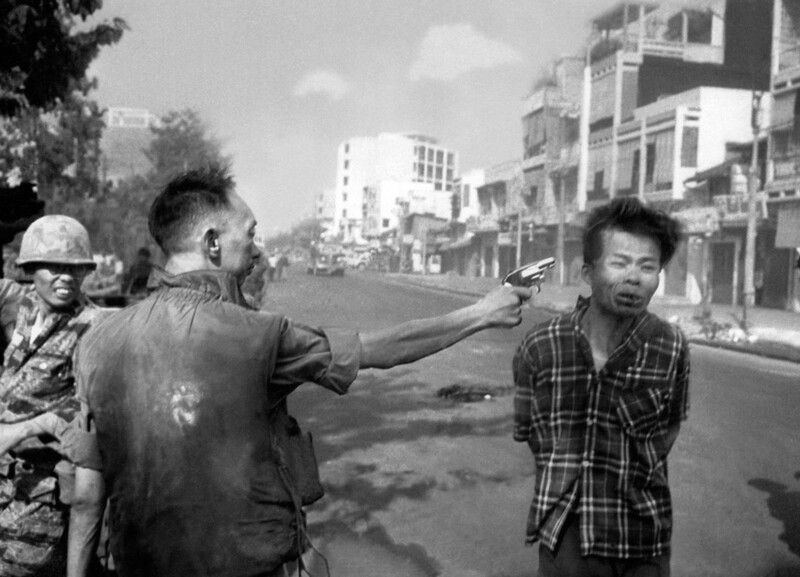 Being able to execute the guy on the spot, like this classic Vietnam picture, might be simpler, but it isn't how we roll. At least not yet. We give folks fair trials, even if they don't "deserve" it, just to make sure innocent folks don't get railroaded when the powers that be cast them as deplorable irredeemables. We also care for such deplorables. We care for everyone, illegal immigrants, suspected criminals, druggies, the whole wretched hive of scum and villainy. From a Christian perspective, that hive is pronounced "the least of these." Our bombing suspect is one of Kenobi's scum, but we take care of him until our justice system is done with him. He might not deserve it, but we're all sinners falling short; some falling way shorter, but still a child of God with the flaws that come from being human. Madam Clinton may have had 2016's smug condescending liberal line of the year the other day, roughly on par with Obama's "bitter clingers" 2008 line. Mrs Clinton's comments about her opponent's supporters were made at an LGBT (lesbian, gay, bisexual and transgender) fundraiser in New York. "To just be grossly generalistic, you can put half of Trump's supporters into what I call the 'basket of deplorables'. Unfortunately there are people like that, and he has lifted them up," she said. But she said the other half of his supporters were individuals who felt let down by the economy and government and were desperate for change. "They don't buy everything he says, but he seems to hold out some hope that their lives will be different. Those are people we have to understand and empathize with as well." Her campaign manager tweeted to say the "deplorables" she referred to were the Alt-Right - a far right, mainly online, group who critics accuse of being bigoted white nationalists. That "alt-right" bucket does fit that description, a rather toxic bunch of paleolibertarians by and large, but they're far from 20% of the electorate. However, half of the Trump base might cheer some of their statements on while backing away from some of the more bile-laden thoughts; while she's not quite alt-right, Ann Coulter comes within hailing distance of that vibe, getting a "yeah!" reply to some barbs at the left while having folks say "whoa, that's a bit much" on others. A larger bucket of Trump supporters may see illegals as deportable, but aren't quite deplorable. They see the country lurching in unrecognizable directions and want to get off that ride ASAP and see Trump as the guy to hit the Stop button; it might do some damage to things, but the current path's even more dangerous. Trump's resonates with paleoconservatives and paleolibertarians who distrust globalist neoconservatives and neoliberals; this piece that made the rounds this week cast both as the Davos class after the yearly Swiss confab of global movers and shakers. The piece also made a vivid allegory of seeing the election akin to Flight 93, where anti-elitists (Trump and company) need to storm the cockpit to keep the terrorists (the establishment left and their wussy neocon enablers) from doing more damage to the country. One problem with the analogy; Flight 93 crashed "harmlessly" into PA farmland as opposed to a more iconic locale like the WTC or the Pentagon, but it still crashed, killing everyone aboard. A third Obama term with less scruples would be a disaster, but would Beamer-Trump find farmland to crash Flight 2016 into? Or would it stumble into a nuclear plant instead?